Free shipping. Buy direct from HP. 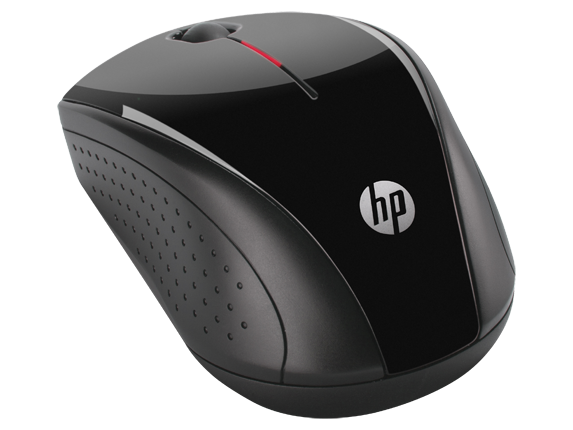 See customer reviews and comparisons for the HP X3000 Wireless Mouse. Upgrades and savings on select products. HP invites you to improve the way you connect and communicate, work and play. Built with strict HP standards and guidelines, this world-class HP Wireless Mouse X3000 effortlessly blends sleek, modern design with life-enhancing, advanced features. Stylish, attractive design: The sleek and modern HP Wireless Mouse X3000 adds an instant touch of trend-setting style to any work space. Glossy black and metallic gray shine with sophistication. Plus, its curvy silhouette gives it a seductive shape. When we set out designing the HP X3000 mouse, we made it our mission to improve the ease and accuracy of wireless peripherals. We circumvented many of the issues that consumers have had with prior generations of wireless peripherals. These issues included poor battery life, difficult setup, mouse inaccuracy, and wireless device detection errors. We took note of these problems and then we got to work building a smarter, more efficient wireless mouse. You’ll love what we’ve come up with. For wireless functionality, we incorporated a nano receiver. Here’s how it works. The tiny nano receiver is tucked away within the mouse. Easily remove the nano receiver and plug it into one of the USB ports on your computer. Turn on the power switch and you’re done. You’ll no longer have to struggle with wavering signals. You won’t have to spend any more time waiting for your computer to detect your device. All you’ve got to do is plug in the receiver and your wireless experience begins. The nano receiver is fast and operates at 2.4 GHz. Your cursor won’t lose pace, even when you zip your mouse around the mousepad. The advantage of using a nano receiver is that the wireless is less taxing on your mouse battery. Since the nano receiver is powered by your computer, not by your mouse, you’ll be saving a great deal of charge in the mouse batteries. The HP X3000 wireless mouse is optimized for efficient, 12-month battery life. You won’t be replacing your batteries every month, like in other wireless mice. Enjoy the ease of wireless technology. Detach from your desktop and operate your computer from any position you please. Kick your feet up. Sit on the couch. Navigate your computer interface from the other side of the office during meetings. You’re no longer stuck in your desk chair. With a wireless mouse, you can operate your computer from any nearby position that makes you more comfortable while you’re doing your work. An efficient wireless mouse like the HP X3000 is perfect for presentations. If there’s information on your computer that you’re going to present to your class or to colleagues, the HP X3000 enables you to control the presentation from the podium. Say goodbye to tangled cords. The HP X3000 doesn’t have any wires that you’ll have to constantly unwind from knots. And you won’t have to struggle with vines of cables intertwined on your desktop. Use wireless keyboards and mice to enjoy a clutter-free desktop. You shouldn’t sacrifice functionality for ease of use, and we didn’t. Like our other wireless mice, we wanted to make sure that the HP X3000 is reliable and functions with pinpoint accuracy. We built this mouse with optical technology, which makes it one of the most accurate mice on the market when you’re using it on a cloth mousepad. The mouse uses infrared light to track the surface of your mousepad, and it relays this precise timing and movement to your computer. Your cursor will move in perfect synchronization with the mouse. You won’t suffer from acceleration, which happens when you move your mouse quickly and the cursor loses pace. No matter how fast you move the HP X3000, your cursor will move proportionally. The accuracy of the optical sensor and the fantastic battery life make this an undeniably great mouse for PC gaming. You’ll be able to place your crosshairs just where you want to place them, and you won’t have to worry about the battery giving out in the middle of a gaming session. PC gaming requires you to develop muscle memory while using the keyboard and mouse peripherals. To develop your muscle memory, you need a mouse that’s consistent and reliable. The wireless mouse HP X3000 is a no-brainer buy for your gaming rig. This is a beautiful wireless mouse. We designed it with gracefully curved sides and a contoured shape so that it’ll be seamlessly embraced by the palm of your hand. Rubber side grips help you maintain a sturdy hold of the mouse, which is especially helpful for PC gaming or using creative applications, when you’ll be moving the mouse very quickly. A scroll wheel is placed front and center so you can use your middle fingers to scroll web pages and windows. And the outer shell is finished in a shiny black gloss. 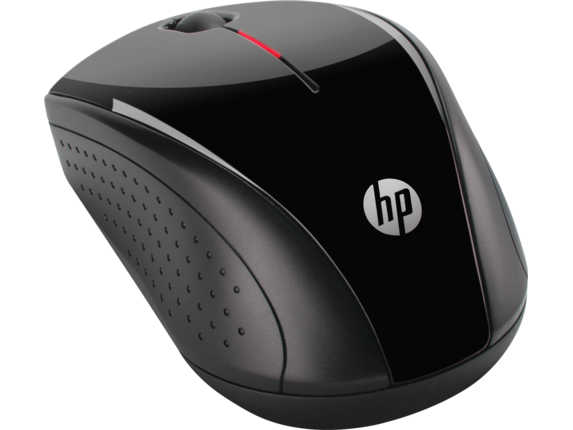 This mouse will look great with any HP computer setup, whether your equipment is light-colored or dark-colored. Weighing only 2.88 ounces, the HP X3000 is easy to push around the mousepad, and even easier to carry with you wherever you go.